I’m not going to lie. I’m completely and utterly in LOVE with Japan. Since arriving back home, I usually spend my spare time looking at photos of my travels or thinking about planning (another!) trip. Fushimi-Inari is iconic Japan. There’s a reason why the torii gates at this shrine are so famous! Tip for visiting: make sure you visit early in the morning (the earlier, the better!) to beat the crowds of tourists that visit every day. Fushimi-Inari Shrine is open 24/7 so if you can visit outside of traditional sightseeing hours, you’re bound to have a magical moment (or two!) here. For more information about how to avoid crowds in Kyoto, check out my guide! The Higashiyama District is the best area for experiencing all of what Kyoto has to offer. The laneways are narrow and filled with tiny restaurants and charming merchant shops selling traditional Japanese crafts. I still remember the exact moment I captured this photo. The laneways were noisy and crowded with people. And as the sun began to set, there was almost a hush that fell across the crowds of people as the golden light filled the street. Tip for visiting: Sunset is the best time to visit this Insta-worthy spot in Kyoto. It can get crowded here (especially if you’re visiting during the summer or cherry blossom season) but embrace the crowds – it just adds to the atmosphere! For more information about how to avoid crowds in Kyoto, check out my guide! Lesser known to first-time visitors to Japan, Naoshima Island is an art lover’s dream. The island is not only surrounded by clear blue water and untouched beaches but is also filled with art museums and exhibits. My favorite spot on Naoshima Island was this adorable pumpkin, by the Japanese artist, Yayoi Kusama. After hearing about Kusama’s exhibitions (her work is often displayed in major cities in the US!) it was especially exciting to see her artwork in Japan. Tip for visiting: As an island, the only way to get to Naoshima is by ferry. When traveling from the nearby city of Okayama, make sure you look up ferry and train times in advance. The ferries don’t come very often, and if you miss one you’ll have to wait over an hour (sometimes longer) for the next one! This shrine is iconic Japan. I mean, where else in Japan can you see a floating torii gate?? 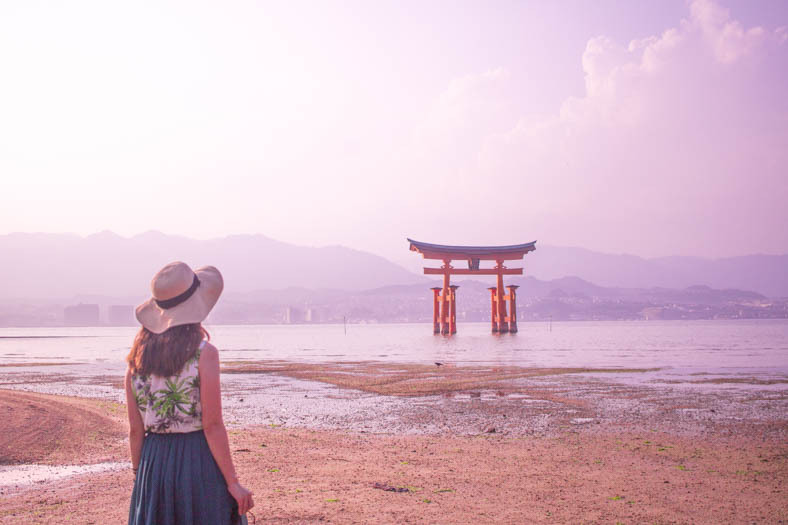 Miyajima Island is just a day trip away from Hiroshima, and most visitors come to see the floating torii gate during high tide. Tip for visiting: to enjoy the magic Itsukushima Shrine has to offer, spend at least one night here. After the day-trippers have left, Miyajima Island is magical. You’ll be able to see the sunset behind the floating torii gate, and as it gets dark, the tori gate is illuminated by lights. Hokkaido is such an underappreciated tourist destination for foreign travelers to Japan. This northern island is incredibly popular amongst Japanese during the summer (it’s considerably colder compared to Tokyo and Kyoto) and is also famous for snow sports during the winter. During the summer months, however, Hokkaido is known for its incredible flower fields. Tip for visiting: Located in a town called Biei, Shikisai no Oka gets SUPER busy with tourists looking for flowers during the spring and summer. If there’s a specific flower field you want to visit, make sure you visit as early as you can, as it can get crowded! I came across an article about Kamikochi while researching a visit to Takayama, and decided to make a short detour there. I am SO glad I visited Kamikochi. Let’s be honest here; Japan isn’t exactly known for its mountainous regions… But despite this, I fell in love with Kamikochi and highly recommend it to those looking for off-the-beaten-path experiences. Tip for visiting: Kamikochi is not the easiest of places to visit! There is no train station here, but the easiest (and laziest way) to get to Kamikochi is to take a highway bus. The bus takes approximately 5 hrs, and there are options which depart both Tokyo or Kyoto. If you’re short on time, you can even take an overnight bus! Check out my guide to Kamikochi if you’d like to know more. If you’ve ever done any research into visiting Japan, chances are you’ll see photographs of the famed Arashiyama Bamboo Forest just outside Kyoto. For good reason – this Bamboo forest is stunning to visit! Tip for visiting: It can get hectic here, and the crowds start to pick up at 9-10 am. So make sure to visit as early as you can and avoid visiting during public holidays or weekends. For more information about how to avoid crowds in Kyoto, check out my guide! Tokyo isn’t known for its temples, but the Sensoji Temple in Asakusa is a sight to behold. In front of the temple are rows of tiny stalls selling souvenirs and delicious Japanese snacks. Sensoji Temple was one of my favorite temples in Tokyo. Like any major city around the world, Tokyo’s skyline is iconic. I loved watching the sunset in Tokyo and seeing all the bright lights illuminate the skyline. Tip for visiting: one of the most budget-friendly spots to watch the sunset in Tokyo is the observation deck at the Tokyo World Trade Center, where entry is 620 JPY – a bargain compared to the entry fees at Tokyo Tower or Tokyo Skytree! Have you been to Japan before? If yes – where was your favorite place in Japan? If you’ve never been, is it on your bucket list? These photos are great. I definitely feel inspired to make it there! Thank you, Amy! I hope you get to visit Japan – it definitely is a wonderful country to travel to. One of my favorites! I’m so glad to hear that Unta! It’s hard not to fall in love with Japan! Fair to say I am indeed in love, such beautiful photos. Japan looks like a dream! Thank you for commenting, Vince!